Voted Colorado’s Number One Metal Roofer from Thumbtack for the year 2015. Thanks to all of our fantastic customer reviews and positive feedback on Thumbtack.com for making this happen. At RME Roofing we enjoy providing our customers with an excellent final product for a fair price. A lot of roofers have tarnished the reputation of this industry but here at RME Roofing we enjoy restoring the faith one customer at a time. RME specializes in metal roofing supplies and techniques most commonly found in harsh climates such as the surrounding communities of Denver, Colorado. The harsh winters and fairly wet spring and summers cause most home owners to seek out a metal roof to replace their shingle, or slate roof. 1. Metal roofs can be made from a variety of metals and alloys including Galvanized steel — hot-dip zinc galvanized G-90 and G-60 steel (a less expensive, thinner-gauge steel, often used in low-end, lower-cost corrugated and ribbed metal panels), Galvalume steel — zinc and aluminum coated steel (A more expensive and longer lasting coating compared to G-90 steel. ), stone-coated steel (G-90 galvanized steel), aluminum, copper, zinc, terne (zinc-tin alloy), and stainless steel. 2. The downside of galvanized steel (G-90, and especially G-60) is that it can corrode, eventually, especially when exposed to moist, salt-spray environment such as in close proximity to the ocean and coastal areas. 3. Steel is the most frequently used material in both residential and commercial applications, mainly due to its lower cost. 5. Aluminum is also one of the best metals to use for roofs located in coastal areas (think those beach homes), where there is a heavy presence of salt spray in the environment. 6. Copper roofs are the most durable and can last for hundreds of years. However, due to prohibitively high cost, few people choose to install an entire roof made from copper. Instead, home and business owners choose copper for architectural details/accents on the roof (bay windows, towers, porches, low slope roof sections, Et cetera). 7. 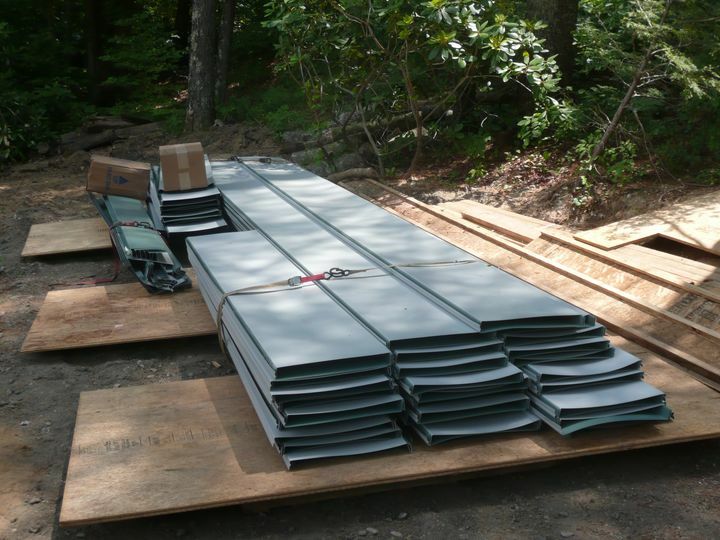 A typical cost for a steel standing seam roof starts around $300 per square (100 square feet) for a typical order. Stone-coated steel starts at $350-425 per square. Steel shingles run about $270 per square of materials. 8. Aluminum is a step up from steel in terms of quality, and therefore in price, costing about $100 more per square than galvanized steel, for both standing seam and metal shingles. 9. The most expensive and premium metals are copper and zinc. They cost roughly the same. Copper is typically installed as copper pans or standing seam panels costing $900-1,400 per square. for materials alone. 10. Steel roofs need to be coated with a special protective (galvanic) coating to prevent corrosion. – Galvanized and Galvalume steel roofing systems are pre-coated by the manufacturer and do not require any further coating. 12. High-end Aluminum and steel roofing systems like standing seam and metal shingles will usually have a high-quality paint finish such as Kynar 500 applied, while lower-end corrugated steel roofs are usually finished with Acrylic paint. 13. It is typically possible to install a metal roof over an old roof, thus eliminating the extra cost and hassle associated with the shingle tear-off (be sure to consult your contractor about the possibility of “over-top” installation for your specific roof). — This is generally possible because metal is an extremely light-weight material. 14. Metal roofs should only be installed by specialists with expertise and ample experience in installing metal roofing, because if the installation is done incorrectly a metal roof will develop leaks (or outright fail prematurely as in the worst case scenario), which may later end-up costing thousands of dollars to repair or replace. 16. The cost of installation for metal shingles is about 20% cheaper than the cost of installing standing seam, because metal shingles are easier and faster to install. 18. Ideally, standing seam should not be installed over asphalt shingles due to telegraphing of the shingles underneath the standing seam panels. 19. Further, when snow piles up on a standing seam roof that was installed over an asphalt roof, the shingles will likely make horizontal dents in the metal panels. Also, metal roofs tend to expand and contract due to temperature changes, and can thus rub against the stone coating on asphalt shingles. – This could eventually cause some corrosion and rusting on the underside of metal panels. 20. Standing seam roofs can be manufactured either on-site or in the factory, which simplifies the installation process. Metal shingles are typically manufactured at a factory, and can be shipped in standard cardboard boxes directly to your house or work-site. 21. Metal roofing installation is more expensive compared to other roofing systems, because it requires specialized training, knowledge, tools and equipment that general roofing contractors typically lack. 23. The base price to install a corrugated steel roofing system starts at around $350 per square. for materials and labor. 24. The base price for metal shingles ranges between $700-1,000 per sq. for materials and labor. 25. The base price for a stone coated steel roof starts at $850-1,100 per sq. for materials and labor. 26. The base price for a standing seam roof ranges between $750-1,400 per sq. for materials and labor. 27. The base price to install a copper or zinc roof starts at $1,800 per sq. for materials and labor. 28. If a tear off is necessary, it is normally a separate cost of about $100-150 per square.